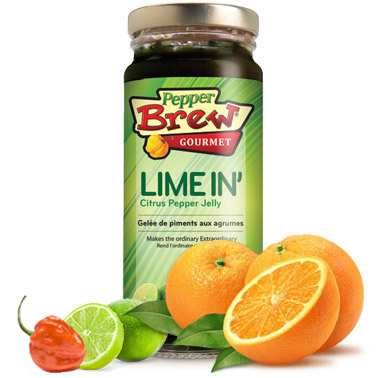 Limein” gourmet pepper jelly is an infusion of intense flavours & heat from around the world. Superb with cheese or in dips. Great for cooking; Try as a rub over pot-roast, poultry or add to stuffing. Use on seafood or, simply use as a condiment. A crowd favorite that leaves you longing for more, in spite of the heat. Limein’ is a crafted blend of fine herbs such as orange zest, lime zest and other spices blended with fruit, orange juice and habanero peppers & scotch bonnet peppers, the celebrities of the recipe. Sweet, packed with a lot of flavor and a lot of heat; this sauce is a treat in barbecues chicken, or a glaze over meat or fish, in drinks such as margaritas, or a spicy lemonade. Try it on sandwichs or as acondiment with any meal.